If you're attracted to the idea of a feature-filled mid-size sedan that won't bust your budget, the Hyundai Sonata should be one of the cars on your list. Also worth noting is Hyundai's very real commitment to including a high level of standard safety equipment on every vehicle. This roomy sedan will smoothly and comfortably get you where you need to go. 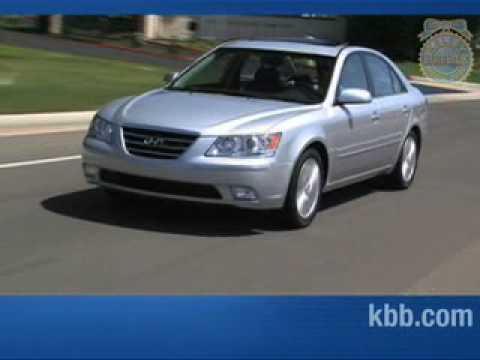 Our Hyundai Sonata is absolutely great! It performs extremely well in all weather conditions and virtually always provides a smooth ride. Whether we're just driving it to the local grocery store or taking it on a three-hour trip down the highway, we have always been impressed with the functionality and quality experience our Sonata gives us. The interior is a very soft cloth material, and there is a lot of space, which is crucial for us since we have two large dogs that we like to bring on car rides. My favorite feature would have to be the Bluetooth, as it makes driving a hands-free affair and is thus significantly safer for driver and passenger alike. For us, the only real issue we had with our vehicle was the tires, which we wound up replacing. They were inconsistently losing air, and the tire pressure would dramatically change each time we went to start the car. Aside from that, we have been very fortunate with our car. My car; likes and dislikes. I love the way my car handles and drives. I feel safe in it in inclement weather. The acceleration is surprisingly impressive for a sedan. Four doors makes loading and unloading very easy, especially with children. The only issues I have had are some electrical problems and the visors will not stay up. My model is 10 years old and is in extreme heat during the summer months, which has probably caused the mechanism in the visors to fail. Ultimately, I like the car. Feeling safe is most important to me. I have owned three cars in my life and this one has been the one I have felt the most comfortable in. Just keep all your car parts up to date and it should run smoothly no problem. Some problems I have learned about my vehicle personally would have to be on my car going up a hill or up on a freeway, so just picking up speed. Another issue for me would have to be my ability to see easily around due to my height and just blind spots in the car. And reliability on the vehicle would be great just need to keep everything up to date and you should be fine no problem.